Our ranking of the year's best new restaurants. Like State Bird, The Progress serves inventive and delicious eats. From the six wackadoo amuse-bouches — fried mussels and jerky are among the highlights — to the floating island, the meal is incredibly fun. You'll spend the entire time looking at the table next to you wondering if you should have gotten that, until the thing you ordered arrives, at which point the table next to you will begin making jealous eyes at you. Unlike most new restaurants in town, these guys are putting out original stuff (no roast chicken or Brussels sprouts in sight). The Progress is a hive of activity, and the bar is stacked two-to-three deep. There's some prime date-scoping action to be had, especially if you have a taste for what appear to be wealthy people on Tinder dates. The drinks, mostly tiki cocktails, are unfortunately often a bit off - too sweet or too alcoholic or too watery - but overall The Progress brings bar game to the table that its older sibling can't match. The absence of the 60-day-reservation requirement/need to wait in line at 3:30 p.m. at The Progress is a huge f*cking win. You may be able to book dinner here a mere two weeks out, like a normal person, or show up and eat at the bar, as long as it's not Friday, Saturday, or 6-8:30. Progress, indeed. At this point, the Progress is well ahead. So why are the crowds absolutely unstoppable at State Bird and merely difficult to manage here? It's all about the dim sum carts. People cannot get enough of State Bird's dim sum carts and trays, with good reason — the fun of picking your meal based on the "eye test" (and the smell test) cannot be matched by words on paper. The Progress makes a valiant effort with its six-course, family-style, "choose your own adventure" menu, but it just doesn't stand up. The Progress is very nearly as great as its brethren, which is a hell of a thing. On good nights, the food might be even better, and the opportunity to come here for a drink and a quick bite is welcome. That said, State Bird feels like a totally original experience that you have to try at least once, while the Progress is just an entertaining, delicious restaurant. Which one fits your needs depends on...you. Six bites of delight. As noted above, fried mussels and jerky were the killers. The cheese flowed freely from within, and it was good. A funky take on raw meat. If you're inclined, get it. We loved it. Our favorite thing here, and the best of the three "packed" meat items. Both sausage and fish bites bring the flavor, and the broth they're submerged in was incredible. Probably the weakest of the three packed meats. Not bad, but the only one we felt could have been replaced. Spicy and crunchy. A strong move. Yeah, you gotta get this. A floating island we wouldn't mind being deserted on...before we ate it. GOOD ONE. Dates stuffed with unbelievably tasty chocolate. 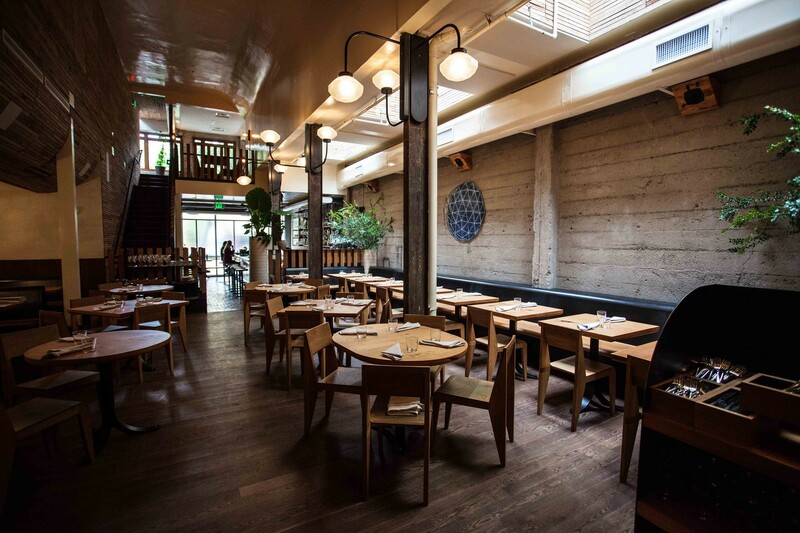 You’ll want to book a table in advance for the dim sum-style small plates at State Bird Provisions in the Fillmore.